Feather dusters are passé. Use a microfiber duster or soft, damp cloth for best results. Work from the top down to avoid stirring up dust. Dryer sheets remove pet hair and other debris from baseboards while creating a static barrier that minimizes build-up. Natural-bristle paint brushes and makeup brushes are perfect for hard-to-reach crevices and corners. Always unplug TVs, computers and other electronic devices before dusting. Old socks and pillowcases are perfect for tricky ceiling fans and window blinds. Before you start, check the carpet for coins, toys and other items that could end up clogging or damaging the vacuum cleaner. As you run the vacuum cleaner back and forth, slightly overlap each pass to ensure that debris on the edges doesn't get missed. Take your time. Rushing is counterproductive, as the vacuum isn't in contact with an area long enough to thoroughly remove dirt. Every now and then, go back over the carpet in the opposite direction for a deeper cleaning. Use the hose and attachments to remove dust from walls and ceilings. The night before, fill a plastic shopping bag or freezer bag with white vinegar. Secure it to the shower head so that the vinegar completely covers it. Let sit overnight and rinse in the morning. For an extra-glistening bathtub, fill it with hot water and let it drain. Apply bathroom cleaner and let sit 15 minutes before washing. Our granite countertops are low-maintenance, requiring nothing more than a soft, damp cloth and mild soap. Be sure to avoid vinegar, bleach and other acidic or abrasive cleaners. Toothbrushes and dental floss work wonders on the scummy build-up around faucets and handles. A cup of baking soda is an inexpensive and eco-friendly toilet bowl cleaner. If some spots remain, use a pumice scouring stick to remove them. Don't forget to clean the toilet brush! Place the handle between the bowl and the seat so the brush extends over the water. Pour bleach over the bristles, let stand for a few minutes then rinse with clean water. Choose a time of day when the sun isn't shining directly on the windows. 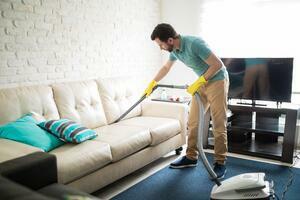 Cleaners will dry before you can wipe them off, resulting in streaks. Use a brush to remove cobwebs, dust and other debris from the frame and windowsill. If you'd rather not use commercial cleaners, a spray bottle filled with one part white vinegar and two parts water works well. Wipe dry using a clean, lint-free towel or crumpled newspaper. Ready for more? Members of our on-site management team share their favorite tips for cleaning the kitchen!